Want to update your Huawei P10 Plus with the Nougat Update. 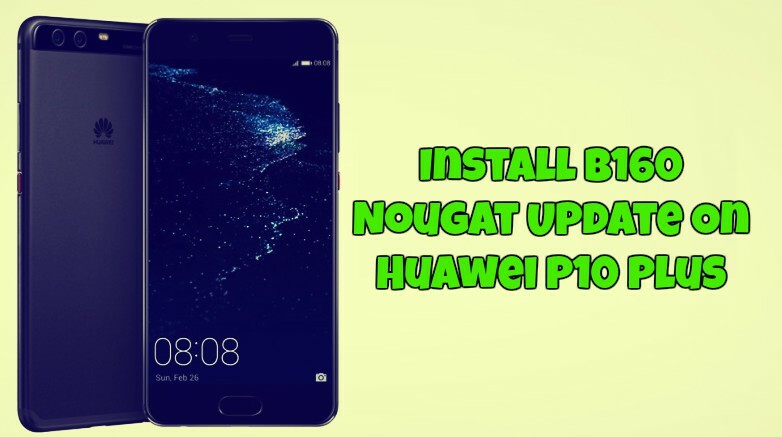 Here is a good new for your, now you can download and install B160 Nougat Update On Huawei P10 Plus phone. The Official Huawei P10 Plus B160 Nougat Update for VKY-L09 variants [Europe] is now released. The ROM is based on the Android 7.0 Nougat and comes with lots of new features and improved battery life. Want to know how to download Huawei P10 Plus B160 Nougat Update, then you are the right place. Here you can install B160 Nougat Update On Huawei P10 Plus easily. This one is the official Nougat update, and this guide is only for the Huawei P10 Plus users. Don’t apply this method on any Huawei Android phone. Otherwise, you will brick your phone. Below are two methods to update Huawei P10 Plus with this official update. First one is for the non-rooted users and the second one is for the Rooted users with custom TWRP recovery. Here in this article, we are providing a step-by-step guide to Install B160 Nougat Update On Huawei P10 Plus. Read all the steps very carefully and follow all the steps. This guide is specially for the Huawei P10 Plus VKY-L09 users. Do take the complete backup of your phone before following the tutorial. Technobuzz.net is not responsible for any damage that might happen to your phone during this process. Make sure that your phone has above 60% battery. Below are the links to Download B160 Software Update for VKY-L09 Huawei P10 Plus(VKY-L09C432B160). Download all these files and save them on your desktop. Once files arwe saved, rename the “update_data_full_public.zip” file to update_data_public.zip and file “update_full_VKY-xx_hw_xx.zip” to update_all_hw.zip. 1. First, you need to Unlock the Bootloader of your Huawei Phone. If you already did that then go to the next step. 2. Download HWOTA_VKY.zip tool files here and save the folder on your Windows Desktop. 3. Now copy all the three files (update, data, and public files) that you downloaded above on your phone internal memory. 4. No extract the HWOTA folder that you download on step 2 on your desktop. 5. From here Run the update.bat file to start the update process. 6. Now connect your device and Reboot into Bootloader mode using “Volume Down + Power”. 7. Now the tool will flash the TWRP in your device. 8. Now Disconnect USB Cable and turn off your device and use “Volume Up + Power” to enter TWRP recovery. 9. Connect your phone to the PC again with USB cable and press the Enter key on your computer to run the TOOL again. 10. Now type 1 on the tool to flash all three files that you saved on your phone. 11. It’ll ask you the update type, again type 1 and press the Enter button twice. 12. This will install the Nougat update on your phone. 1. Unlock the bootloader of Huawei P10 Plus and install the TWRP custom recovery. If you already did that then skip this step. 2. Download Huawei P10 Plus B160 Nougat files (Three files from download section) and save it on your device. 3. Now Boot your device into TWRP Recovery mode. Use “Volume Up + Power” to enter TWRP recovery. 5. In TWRP go to install option and locate the Update.zip file and flash it. Once done, flash the second and third firmware file. 6. Wait until the process finishes. 7. Once completed. Reboot your device and enjoy. So this is the full guide to download and Install B160 Nougat Update On Huawei P10 Plus. If you have any questions comment below.